Last week my colleague, Wale Martins, posted a great summary of all the Microsoft Ignite sessions focused on Microsoft Azure Stack. For all of you attending Ignite, this is a good guide to learn more about some of the sessions we plan to deliver and when they will occur. If you are like me, you crave as many details as you can get about each session, especially the technical sessions. This blog post provides more details about what you can expect from some technical sessions on Thursday and Friday at Ignite. Are you ready to learn how to become a cloud administrator, Microsoft Azure Stack, infrastructure managing rockstar? If so, come start your journey to rockstar status in this session. Hardware management: How will cloud administrators manage the hardware supporting Azure Stack? Monitoring: How are concepts like health and alerting enabled? This session is just the start of our journey together. Feel free to follow us @chasat and @troettinger for more updates on these topics and come visit us while we are in Atlanta! Azure delivers Infrastructure as a Service (IaaS) at hyper-scale, with a massive global infrastructure behind it. So how will Azure Stack deliver an IaaS offering that looks, tastes and feels just like Azure? Scott Napolitan and Mallikarjun Chadalapaka, program managers on the Microsoft Azure Stack team, show you how Azure Stack delivers an IaaS experience that is consistent with Azure yet uses infrastructure at a fraction of the scale so it fits into your datacenter. They also plan on doing some demos to help drive the learnings home and show how seamless the experience can be. Azure Stack provides consistency with Azure which allows you to reuse artifacts across clouds. But, how do you create those artifacts? And why are they so important? They will complete the session with a more advanced, production-ready, deployment scenario. Join us and learn how to get started with ARM templates for Azure Stack and Azure. Do you want to learn how to give your organization’s developers the flexibility of the cloud with the security of your own datacenter? 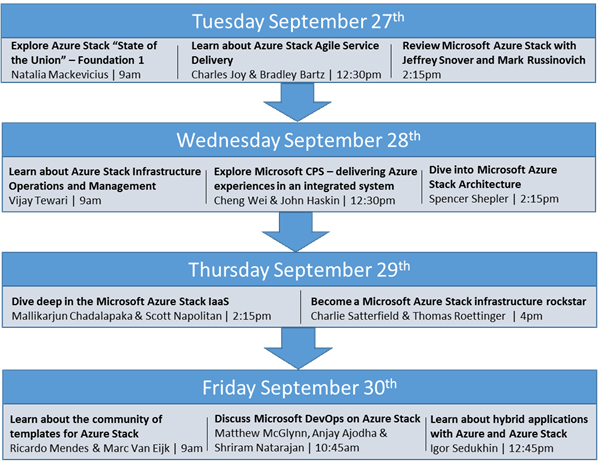 If so, attend this session and learn about how Azure Stack integrates into a modern DevOps workflow. What is DevOps and how does it bring value to your organization? How can your developers define an application’s infrastructure through Resource Manager templates, and deploying to Azure Stack? How can rapid changes be made to an application’s infrastructure? How can you bring DevOps to your own organization? They also have some exciting demos planned! Do you build and operate applications that use public cloud resources and resources in your datacenter? Are you doing cutting edge Hybrid App development? If yes, this session is for you! Please join my colleague, Ricardo Mendes, program manager on the Azure Stack team, to learn how can you use Azure Stack to build solutions comprised of resources in the public cloud and on-premises in a consistent way leveraging your knowledge of Azure. All our presenters are excited to share their knowledge of Azure Stack and answer your questions both after their sessions as well as in our booth on the Expo Hall floor. We hope you are looking forward to learning and networking next week. See you in Atlanta!